Installing the Kodak Printer Software on a Mac system is not a difficult task. After you set up the hardware of the printer and install the ink cartridges, the next step is to connect it to a preferred network by installing the compatible printer software. The driver file format varies depending on the operating system. Most of the old drivers have .dmg file for installation and the recent drivers come as an application that makes the installation process easy. The steps below provides you a quick way to install Kodak printer software on mac. Check if you have good network connectivity. Open any browser on your Mac system. Search for the printer driver that is compatible with your Operating System. Click the Download or the Save button next to the chosen driver file. Insert the installation CD into your system that came along with your printer package. Make a copy of the contents in the CD to a USB drive, in case you are using the recent Mac OS. Double-click on the .dmg driver file to begin the installation process. Update the printer driver firmware for an interrupted service while performing the printer functions. Step 1: Drivers enable communication between two different devices. Firstly, check if you have good network connectivity to perform the installation process. Remove any connections made with your printer and the system while performing the installation process. Step 2: Double-click on the downloaded printer driver file. The driver format will be in the .dmg. On clicking on the Kodak Driver File, the KODAKAiOPrinter Installation Wizard will open. Two options such as Install Printer and Uninstall Printer will be visible. You can install Kodak printer software on mac entirely or by viewing the driver package contents. Step 3: If you want only some printer functions to happen, run and install the same by selecting the necessary files. Now, you will have to right-click on the Install Printer option. Click the Show Package Content option. Choose the AiOInstaller option from the Contents or the Resources folder. Step 4: Menu names may vary with respect to the printer model and the Operating system you use. Once again, right-click on the folder name and select the Show Package Content option. The Package content will be visible on your Mac system’s screen. Step 5: Locate the ‘Kodak AiO Printer Driver.pkg’ file. Double-click on the package to start the installation process. Similarly, you can run and install the necessary driver packages on your Mac system. 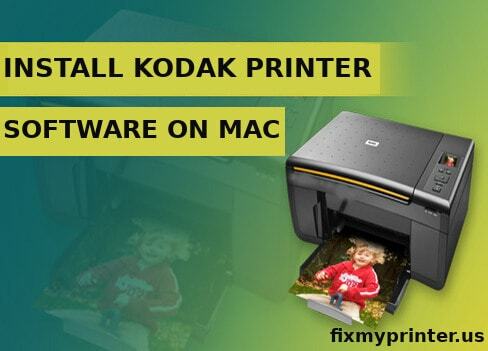 By following this process, you can install Kodak printer software on mac and the driver firmware for selected functions of your printer without any issue. Step 6: In case you opt for running and installing the printer driver completely, click on the Install Software option and follow the prompts onscreen. After the completion of the driver firmware, press the Finish button and start performing the functions easily using your Kodak printer. Step 7: Click on the Apple icon on your system. Choose the System Preferences option and choose ‘ Print and Scan ’ or ‘ Printers and Scanners ’ option. Check if you are able to view your Kodak printer on the device list. Step 8: If you are not able to find your printer on the list, click the plus symbol (+) to open the Print browser. Wait until your Mac system identifies the Kodak printer. Once your Mac system identifies your printer, start using the printer to perform the printer functions. Step 9: Check if you have connected your Kodak printer to the direct power socket. Use the ink cartridges that are genuine with your Kodak printer. Load the printing sheets that are recommended by your printer. Step 10: Use your Kodak printer effectively to perform the printer functions by setting it as a Default Printer after the successful install Kodak printer software on mac.